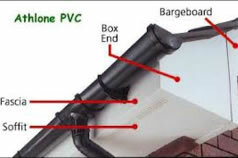 A uPVC replacement roofline purchase will probably not be the most glamorous you'll make, but its a great affordable investment for your home. Great affordable way to improve the appearance of your home with this affordable system, saving you time and money in the long run. Flinn Construction will fully replace all your old rotten wooden fascias, soffits and any guttering. We use ventilation bird comb to prevent any unwanted visitors in your loft space and eaves protectors to allow the roof joists to breathe and this also prevents dampness which can lead to rot in the future. Talk to us today about installing new fascias, soffits downpipes & guttering. We will send round a dedicated roofline installer to have a look at your property for a free quotation.